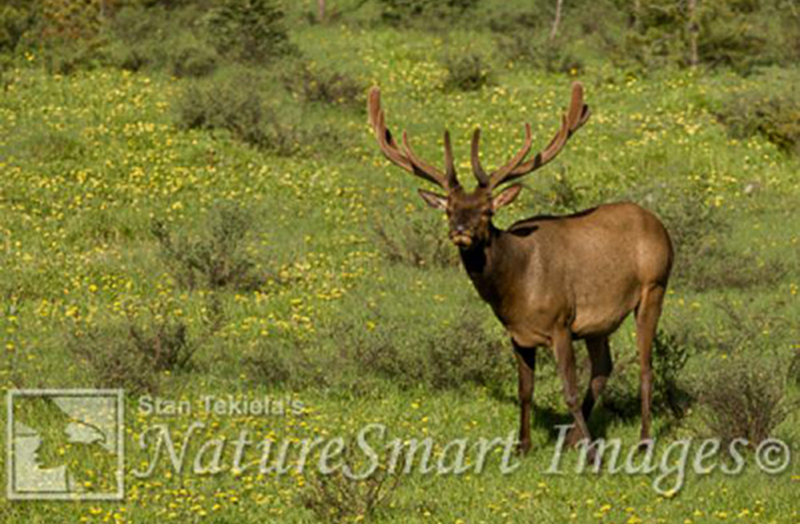 In today’s NatureSmart column, Stan Tekiela shares with us his encounter with a large bull elk. Sounding determined and confident, a large bull elk, most likely weighing 1,200 pounds or more, bellowed and bugled right in front of me. His back was arched, his head was held upward, his mouth was pursed in a funnel shape, and his antlers flanked his strong shoulders. The sound of his bugling echoed off the mountain valley walls and came around for a second time, amplifying his clear message of strength and dominance. He was keeping a watchful eye over 20 or more cow elk in his harem. From over my shoulder I suddenly heard another bull elk respond with his own impressive bugle call, followed by some deep belly grunts. By the sound of it, he was very close. Neither I, nor the bull elk I was photographing, could see this other bull, so it came as a bit of a surprise for both of us. 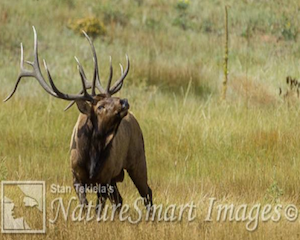 I just returned from a week of photographing the elk rut in Colorado. The aspen trees were blazing bright yellow and stood out against the Lodge Pole Pine forests, signaling the end of summer and the start of the elk rut. With testosterone running high, my bull elk moved into a clearing. Immediately, the second bull appeared out of nowhere. I could see that he was just as massive and meant business. I’ve seen these kinds of challenges many times. Normally, what happens is that the two opponents approach each other and turn sideways to show off their size. They then walk/run parallel to each other, much like a dance. They do this for 50 or 75 yards, then turn and trot back. Then one of them puts its head down and turns toward the other, ready to fight. Just the suggestion of fighting usually is enough to send one of them running off and it’s all done. But not this time. Within seconds of approaching each other, these two bulls ran straight for one another, heads down, antlers pointed forward and intent on fighting. I barely had enough time to swing my camera around on the tripod and frame up a shot when the two bulls locked antlers and started pushing. Dust and dirt was flying and I could barely see what was going on. I could hear the antlers banging against each other with a very distinctive cracking sound. Then it was all over. My camera shoots 14 pictures per second. Altogether, I took about 56 images, which means the entire encounter lasted about 4 to 5 seconds. And in that amount of time it was determined who was stronger and more dominant. That is how it goes in nature. The strong survive and win the rights to reproduce and pass on their genes. This ensures that the population of elk in the future is the strongest and healthiest. In this case, the reigning bull elk retained his harem of cows. But the challenger didn’t go far and continued to bugle in response to the king’s bugles. All day and for much of the night, this kind of challenges goes on. During the rut, the males spend much of their time corralling females and fending off challenging males. This leaves little time to rest and eat. So each bull loses weight (and therefore strength) as the rut drags on. By the end of the rut, which can last upwards of two months, the male will have bred with all of the cows in his harem. Winter has usually settled in by the end of the rut, leaving the bull tired and weak. Food supplies are low, and, if the winter is particularly harsh, some of the bulls won’t make it through. It’s a heavy price to pay for being king. 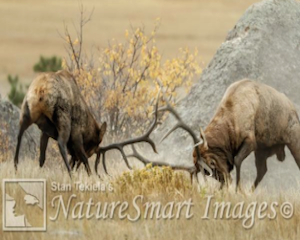 Stan Tekiela is an author, naturalist, and wildlife photographer who travels the United States to study and photograph wildlife. He can be followed on Facebook and Twitter. You can contact Stan via his web page. Stan’s nationally syndicated NatureSmart Column appears in more than 25 cities spanning 5 states (Minnesota, Wisconsin, Michigan, Illinois, and Pennsylvania) and is circulated to more than 750,000 readers.